Track down every last korok in Hyrule by equipping the Korok Mask. Here's how to get it. Zelda fans are likely aware that The Legend of Zelda: Breath of the Wild features a high number of koroks -- 900 of them, in fact -- but it's difficult for many players to collect them all without a little bit of help. 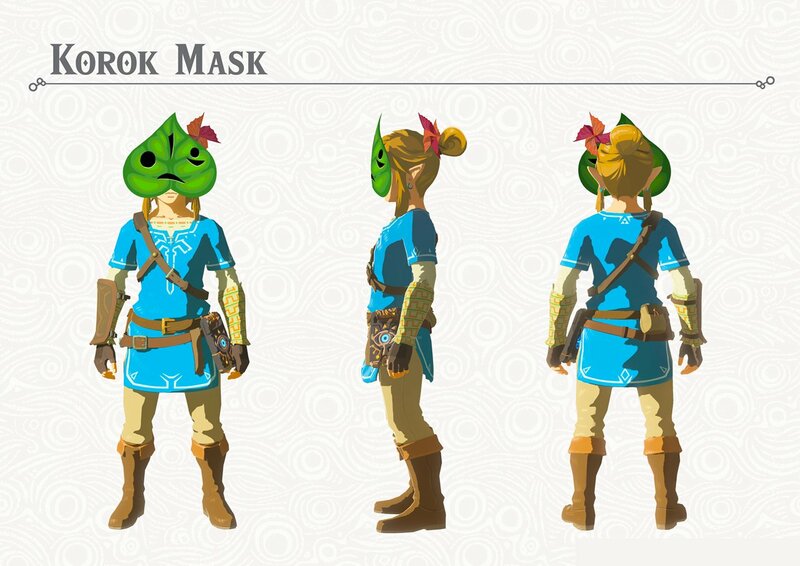 Enter the Korok Mask, a new piece of armor from the Master Trials DLC that helps Hyrulean Heroes track down every last korok hiding around the world through one simple little trick. Getting the Korok Mask isn't terribly difficult, so with a little bit of time and a little bit of downloadable content, players will be well on there way to collecting all 900 koroks. Here's where to find the Korok Mask as well as how to use it. Like many an ancient treasure to be left lying around the kingdom of Hyrule, the Korok Mask in Breath of the Wild can be found in the Lost Woods. It'll only appear if the player has purchased the Master Trials DLC, but assuming that transaction has been completed, players hunting down the Korok Mask should start from around the Woodland Tower. After entering the Lost Woods, players will want to follow the trail lined with torches until they spot two torches flanking a tree. From there, pick up an unlit torch next to one of the torches, light it, and pay attention to which way the wind blows the flame -- the wind will point the player in the right direction. Naturally, for those who can't be bothered for the details, players will need to head first west, and then north. In a hollowed-out tree that only slightly resembles a monster, players should find a massive treasure chest containing the Korok Mask. Using the Korok Mask in Breath of the Wild is simple and passive. The mask will simply begin to shake any time the player is in the vicinity of a nearby korok, and when the player get's really close, the mask's pinwheel will spin and sparks will fly out. All that's left from there is to thoroughly explore the surroundings to uncover the hidden korok, completing any hidden puzzles if necessary. Modojo has many other great Legend of Zelda: Breath of the Wild guides, including tips on how to get the Master Sword as well as a list of the best amiibo and what they drop.